Francois-Raoul Larche's activity corresponds with the pinnacle of the Art Nouveau period, of which he remains one of the most remarkable representatives. After some studies at the École des Beaux-Arts, particularly under the direction of Jouffroy and of Falguiere, Larche debuted at the Salon of 1884 and obtained the second Grand Prix de Rome in 1886, having only made his debut at the Salon two years before. Over the next 30 years Larche was awarded many honors and would receive an impressive crop of state and public commissions during his fairly brief career. In this era Larche was greatly admired as a modern sculptor. He won one of his greatest successes with a sculpture of Loie Fuller, in which she was enveloped in a whirlwind of sails. 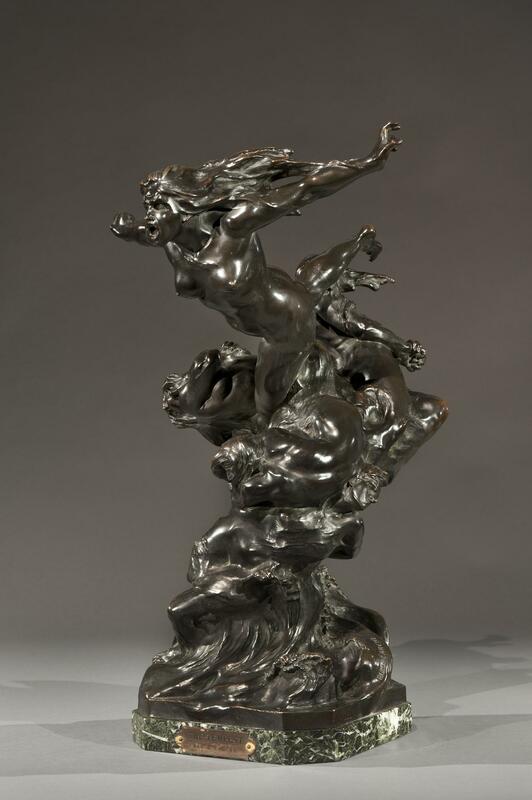 Fuller, a famous American dancer then performing with the Folies-Bergeres Troupe, inspired many editions of statuettes in bronze of different dimensions, often gilded, and often incorporating lamps with one or two lights. 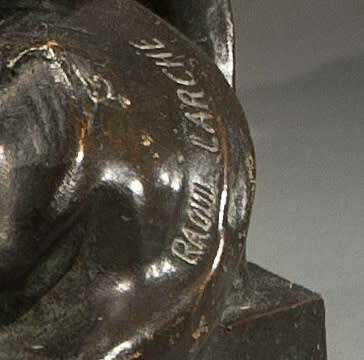 Raoul Larche received some official commissions for monuments in Paris including the Grand Palais. 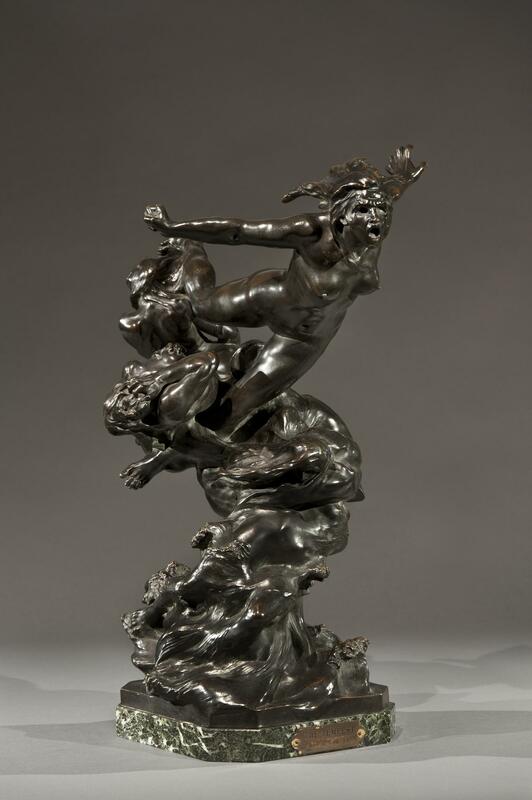 Other commissions included those for the Exposition Universelle of 1900 and in 1909 for a basin on the theme of La Seine et ses Affluents, originally intended for the Carrousel but finally placed on the north corner of the Grand Palais. It still stands at that site, now facing the entrance of the Galeries Nationales. When Larche exhibited his La Tempête et Les Nuées (The Storm and her Clouds) at the salon of 1896, he shocked and divided an art public accustomed to his typical sweet and graceful subjects. For an artist best known for his depictions of Loie Fullers' dances and lyrical allegories such as his Les Violettes, the group was certainly a departure. Clouds in the form of writhing angry nudes are led by the storm, personified as a powerful screeching woman, arms out-flung to destroy everything in her path. In his review of Larche's career, Renoux was troubled by La Tempête and wondered at the artist's audacity in trying to illustrate something as “untranslatable” and “elusive'” as a storm. On the other hand, critic Henri Rochefort claimed the piece was a masterwork and described it as “Michel-angelesque”. The Salon exhibit piece was purchased by the Ville de Paris for 13,000 francs. 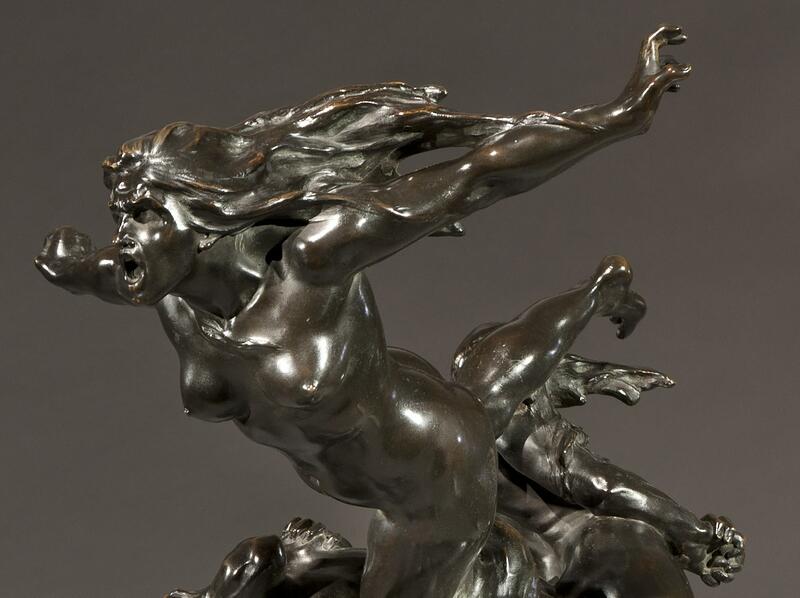 A bronze version over three meters tall was exhibited at the Exposition Universelle in 1900. The present reduction is a particular fine and detailed cast.